The NSW Business Chamber has been helping to growth and sustain business across the state for almost two hundred years. It is the largest mission-based organisation of its kind in Australia. In 2017/2018 the Chamber underwent a strategy refresh called ‘Chamber 2.0’ in which it focused on better meeting the changing needs of its customers and members. Specifically, to deep dive the services that are most relevant and valuable to those it engages with and therefore ensure its place in sustaining NSW business growth long into the future. To do this the Chamber went through a careful analysis of shifting customer segments, member needs, and the supporting organisational infrastructure required to support the delivery of these in a contemporary and relevant way. 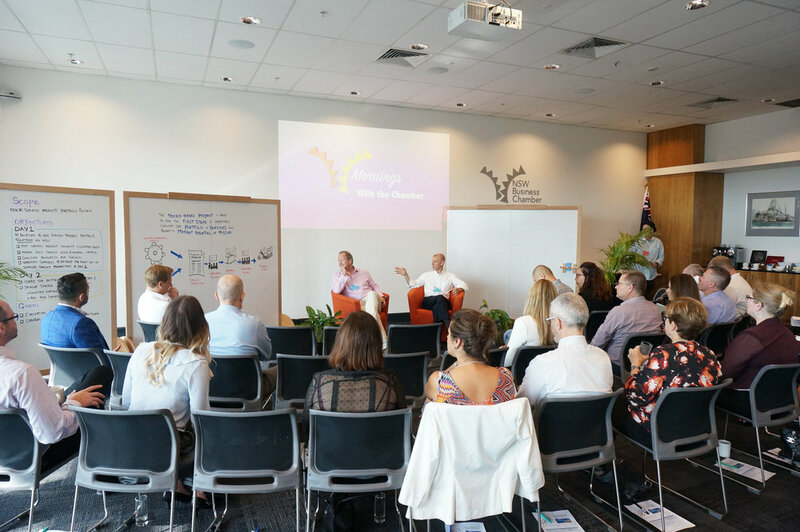 TwoCollaborate has assisted on this journey by creating a platform for all those within the organisation to come together to discuss strategically the future of the organisation. It also, help to get hands-on and into detail for using codesign to rapidly chart the current state of existing systems. The answer is to introduce new information and structures to enable new ways of conceiving the world. In order to for the chamber to act differently, first it needed to explore and understand the world differently. We also provided advisory services to build out two permanent collaboration spaces, and creative support of visualising strategic artefacts and helping these to be communicated more effectively. “The challenge for us was to bring a new way of thinking into a very established environment and to challenge ourselves to think really differently about our own world. The Chamber has been successful for long time and reconceiving our organisation from within was always going to be challenging. TwoCollaborate introduced a framework and method for thinking differently from the outside that let us really harness the power of our talent from within. They helped us do this quickly and efficiently. In todays environment, there are high expectations of the pace of change, and while our journey might take two years, we really needed to get the momentum up early. I really believe that this is the ‘new normal’ for how work should be done. Fundamentally change is about making decisions. And to do so at pace, one has to cut through traditional ways of working with a credible alternative approach that takes your people on the journey”. “TwoCollaborate have become an essential business partner in supporting the enterprise wide transformation of the NSW Business Chamber into a digitally enabled, customer first organisation. With 190 years of tradition, 800+ staff and a hybrid of mission based and commercial activities, the task of facilitating new thinking and strategy development has been substantial”.